Is it possible to try to make games with this yet? No matter what I do I can’t seem to open any kind of editor, and I think I’ve downloaded all the things there are to download. The editor is not in a usable shape. Currently you can only modify the map and look at the events. Therefore the only solution is to use the official 2000 or 2003 editor for now. If you are adventurous, you can try the R48 editor. It’s a free-software open-source editor written in Java by 20kdc. It’s not very popular yet, so expect some rough edges here and there, but it’s fully working. It’s interface is different from RPG Maker (it’s author doesn’t even own RPG Maker, he just looked at the internal format and created the interface from scratch), but it can edit all the game data. You can read about it here and grab the compiled version here. It allows placing more than one event on a single tile. 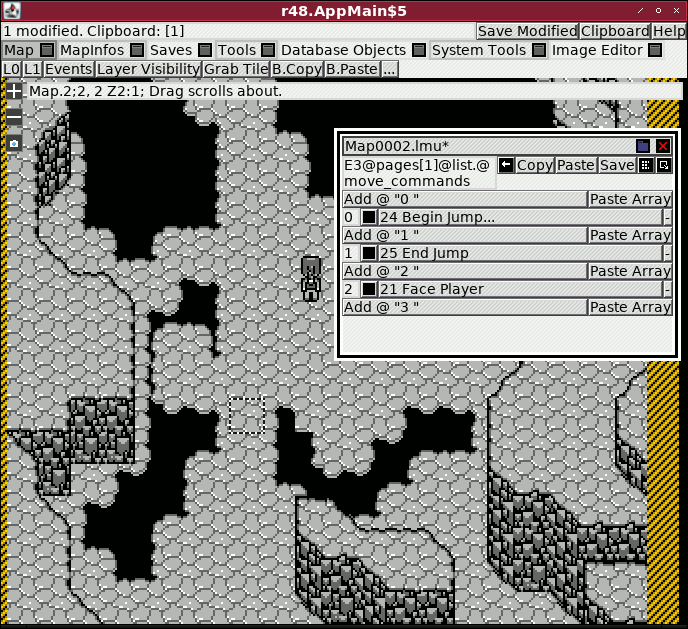 It doesn’t come with the default graphics, but you can use EasyRPG’s RTP as a starting point. Or you can create the graphics yourself, using the bundled editor. It also doesn’t have pre-made characters, items, skills, etc., so you’ll need to create everything yourself. If you have questions about this editor, you can either ask them just here, or contact the author: he is often seen in EasyRPG’s IRC channel or in rpgmaker.net’s Discord.